Daca anul trecut, in ziua finalei primei editii Balkanic Golden Race, vantul a batut din directie spate-lateral (NNE) si temperatura maxima nu a depasit 20 de grade Celsius, viteza castigatorului fiind de 1270 m/min, finala din acest an s-a derulat exact “in oglinda”. Vantul a batut puternic din fata (SV), pe aproape intreg traseul, atingand la rafala peste 40 km/h (!) in unele zone, iar temperatura a sarit de 25 grade Celsius, conditii ce au determinat ca viteza primul porumbel sosit sa fie de 890 m/min (+10h zbor). Crescatorii care au concurat in campionat pe ruta Ucraina sau Moldova tin, cu siguranta, minte ziua de 22 septembrie, chiar unele grupari columbofile vecine nu au inregistrat nicio sosire in prima zi de la distante echivalente pe aceasta directie, din mii de porumbei angajati, fapt care subliniaza duritatea concursurilor din acea zi. Felicitari si respect porumbeilor castigatorilor Balkanic Golden Race! If last year, on the final race day of the first edition of the Balkanic Golden Race, the wind blew from NNE (tail-side wind) and the maximum temperature did not exceed 20 degrees Celsius, the winner's speed being 1270 m / min, this year's final was exactly "in the mirror". The wind beat strongly from the front (SV) on almost the whole route, with gusts reaching over 40 km / h (!) in some areas, and the temperature jumped to 25 degrees Celsius, conditions that determined the speed of the first pigeon to arrive to be 890 m / min (+ 10h flight). The breders who competed in the championship on the Ukraine or Moldova route definitely remember the day of September 22, even some neighboring Feds did not record any arrival on the first day from equivalent distances in this direction, out of thousands of basketed pigeons, fact which highlights the hardness of the races in that day. 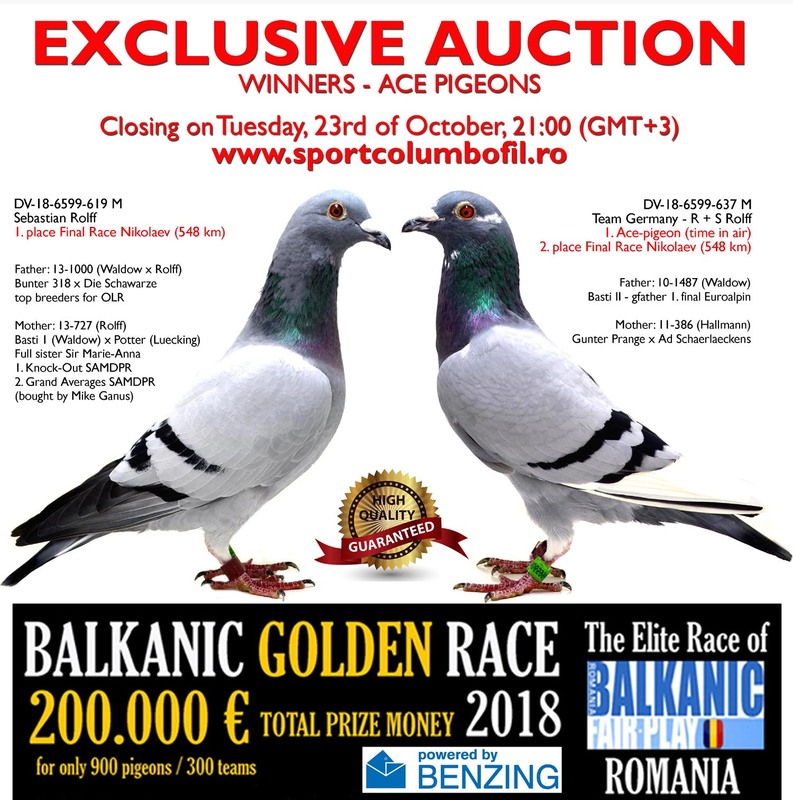 Congratulations and respect for Balkanic Golden Race winners!